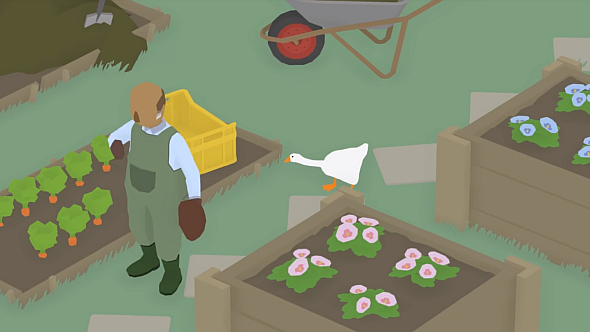 Australian developers House House are making a game in which you are a horrible goose and it looks amazing. If you’re not already sold, just watch this pre-alpha footage. You wouldn’t catch a triple-A doing this. For more hilarious nonsense, here are the best indie games on PC. From what we can tell, it’s based around only two interactions: honking, and grasping things with your beak. But oh, the antisocial possibilities: drop people’s sandwiches in lakes. Honk loudly behind them while they’re trying to concentrate. Honk to make them look around as you hide in a bush. Honk just to be annoying. Constantly. Your anarchy will be at least partially directed by a set of objectives, but this looks like the kind of game that’s best when nonsense emerges organically, so we hope there’s room for that. We also hope the music works as it does in the trailer, because it’s perfect. The game is untitled for now, and due some time next year. House House’s debut title, Push Me Pull You, is on Steam here, and isn’t as disturbing as it looks.